Instead of compiling your own in-depth research on PC component specifications (that usually involves hours of research, many 'tabs' on your browser and countless google searches), we have done most of the hard work for you. We have tried to create simple yet comprehensive way to compare specifications of computer parts with custom-built PC component databases. 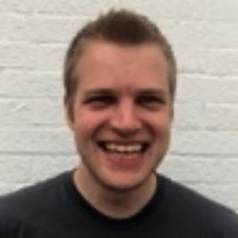 Why have we built HardwarePick? Comparing computer part specifications is not a simple process - usually involving hours of research with all the information usually needed to make an informed decision scattered around the web - with typical resources found on reddit, forums and official manufacturer pages. To find the exact/in-deth specifications of models involves many browser tabs open and hours of research to find exactly what you're looking for, whether it be motherboard VRM information, graphics card dimensions or PC case volumes. There should be no reason for why computer part comparisons should be so tedious and time-consuming, so last year we decided to simplify this process by building a database tool for PC builders, both novice and professional, to quickly and comprehensively compare PC components. 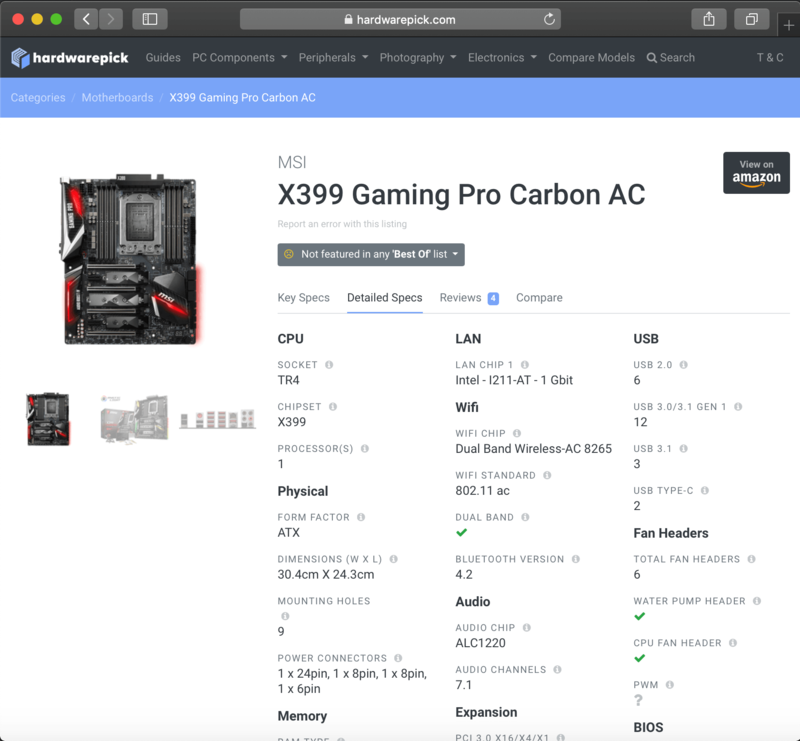 Current popular PC building websites like PCPartPicker provide a basic overview of each part until further selected to view. Excelling in building the PC on their site the user must go to product pages to find more specific features of individual parts. At HardwarePick we aim to be that immediate location for in-depth information or to compare products and simply their hardware values. We strive to be the other “tab” when joined with PC building sites (such as PCPartPicker); instead of multiple manufacturers specs sheets open, only one page is needed via HardwarePick. PC Builders are always looking for a better source for building their PC and comparing parts, and we hope to incrementally make the whole process a little bit easier and less time-consuming. 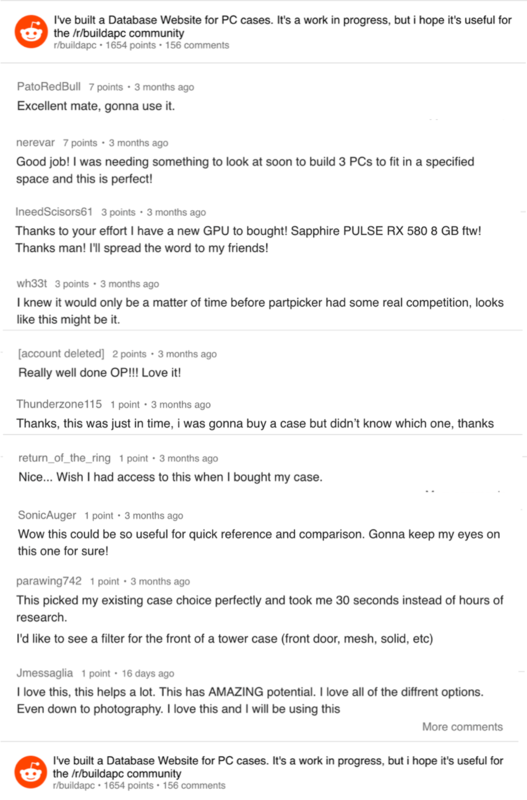 In July 2018, we shared our database tool with Reddit’s biggest PC building subreddit with over 1 million subscribers, /r/buildapc, and were overwhelmed with the response - reaching number one on the subreddit with >1600 upvotes, 65k views and 96% upvote rating. 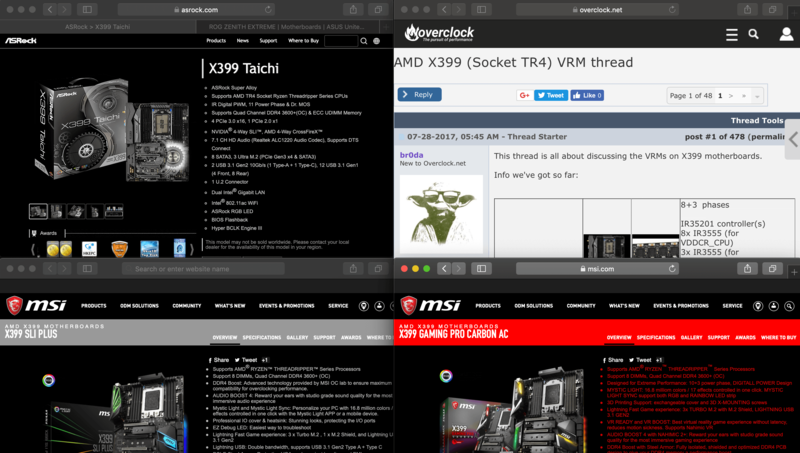 We further developed the site based on the welcome constructive feedback from other Redditors - to strive to make it as user friendly and useful for comparing PC parts. The database at Hardwarepick is designed to keep aesthetics and functionality in mind. Whether comparing graphics cards, motherboards, or CPU’s, the easy to read spreadsheet is fully customizable to the user’s preference and can narrow down their selection with standard drop down options. The addition of color scaling provides a quick visual representation of each component and how it compares to its competitors or analogous models. Striving for simplicity with comprehensive information for the user, you are bound to find what you are looking for within the database. 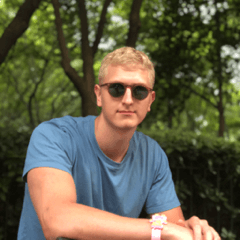 Alongside the database many of the specifications for parts are scoured throughout the internet for things common and not; Keeping in mind any international users brands like Galax, Palit, and Colorful are brought into the database in addition to the common US brands. At Hardwarepick we strive for accuracy, but customers of each product and enthusiasts provide more in depth information many websites do not provide. We provide and easy way to report errors and can promptly fix them with ease. The depth of the database not only can be compared with as many items of a users choosing; but once a user has gotten their choices between two products, a unique comparison page is displayed pitting the two pieces of hardware together. A side by side comparison that isolates both brief and in-depth features including other reviewing websites. 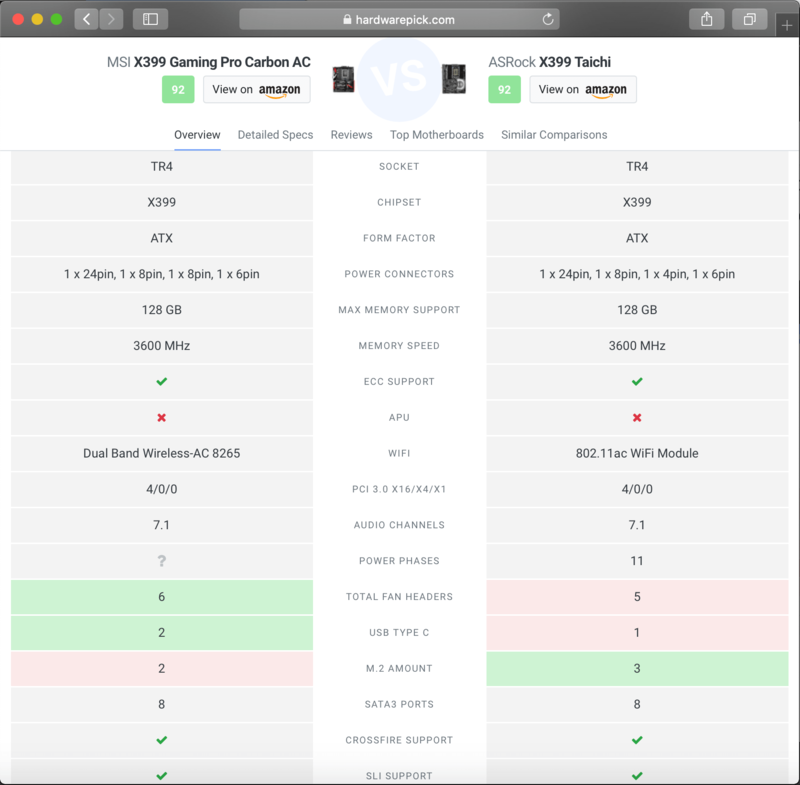 The side by side comparison brings even quicker decision making for the user and provide other motherboards with similar specs should they choose. 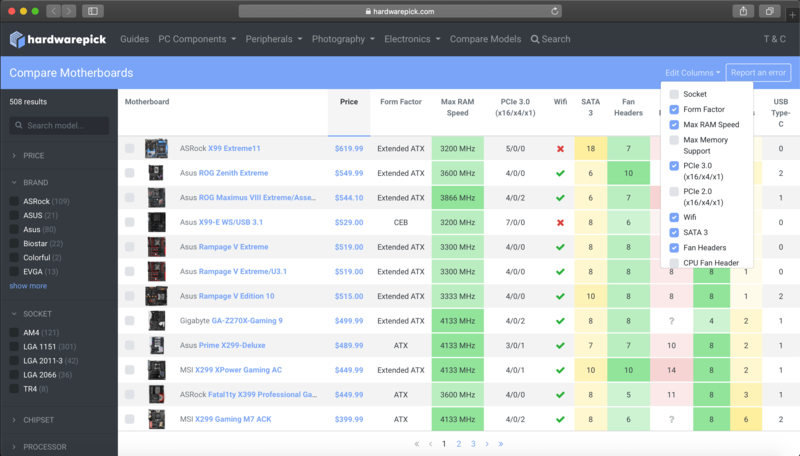 If the user is starting out to look on HardwarePick, and knows a specific chipset or socket they want to use; the comparison chart is the best place to be. The comparison charts are designed for when for example a B450 motherboard is wanted, but doesn’t want to select and edit the columns accordingly. This quick method simply brings in only B450 motherboards and brings the familiar feel of the full database for easy recognition. This is not only limited to motherboards and includes many of the popular products PC consumers use today. 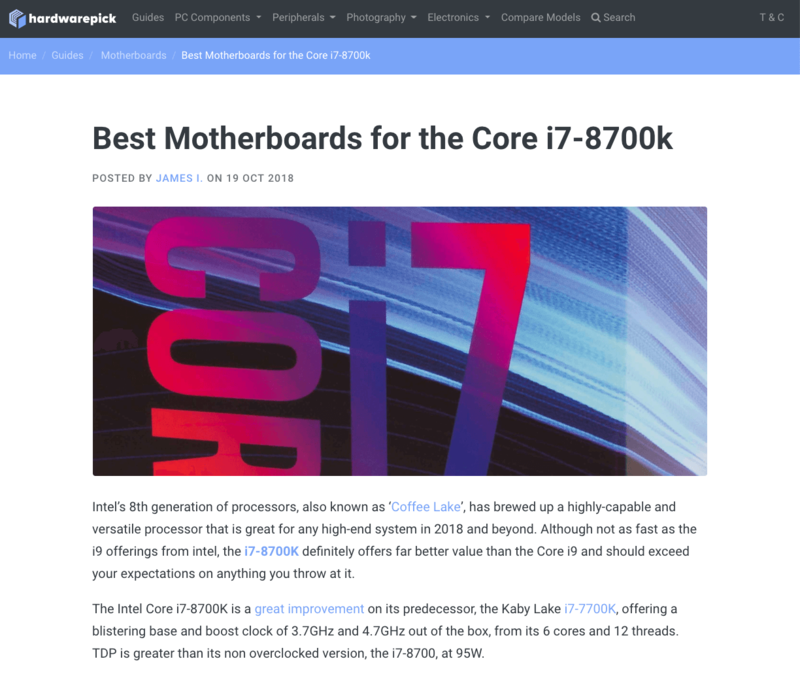 For beginners or first-time PC builders, it is not always clear what to look for when picking PC parts - for example what the most appropriate motherboards are for the Intel Core i7-9700K. WIth HardwarePick, we regularly produce guides that help solve and provide product recommendations for commonly-asked build questions - helping to inform you on what to look for to make your own educated decision or build from one of our product recommendations. We think the best way to grow and develop HardwarePick further is by listening to the community. 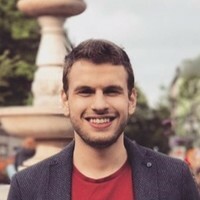 We have made this our priority since receiving feedback from our Reddit post, and will continue to do so. If you have an idea on how to further the use of HardwarePick and help grow this tool, we would love to hear from you. Please visit our contact page here if you want to get in touch with us, and we'll do our best to get back to you as soon as possible. We are a small team here at HardwarePick trying to offer the best possible database for comparing PC part and peripheral specifications. If you have any questions or perhaps are interested in helping in this project, please do not hesitate to contact us.